Cambodians in general and Kuy in particular are oral people. The Kuy people have an extremely low rate of literacy. 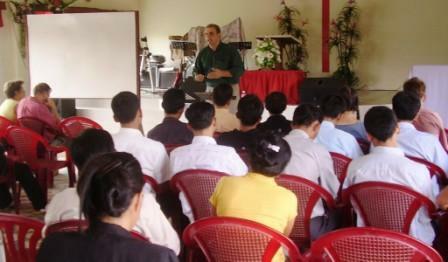 So, developing oral strategies is an important component to our ministry. We feel that Bible Story telling will be a very effective way to get the good news to these people. Everyone loves a story! And there are great stories in the Bible. Also, telling a story requires no books, materials, videos and equipment nor even much training. It is very easily transferable from one person to the next. Many of the world’s peoples come from oral cultures. They learn by observation, participation and verbal communication, not by reading. Even people who can read often prefer to learn in those same ways. For further information on orality, see the International Orality Network site at http://oralbible.com. One tool that the network is now promoting is an 80 minute video called “God’s Story.” This video has been translated into Khmer. It is a chronological version of the Biblical narrative. To learn more go to http://www.gods-story.org. The Orality Network held its first meeting in Khmer language last month. This meeting was very well attended, about 60 Cambodian Church Planters, Christian workers and Bible School students attended. Dale Jones, a fellow MUP missionary, taught the group on the need for oral methods in this culture and the Biblical basis for oral methods. He then gave an example of one of the 14 stories from his evangelistic story set and had all of us practicing telling the story in groups. CDs and tapes with the stories and booklets with the written stories sold quickly. We hope that this will result in many of the participants telling Bible stories in their churches, at preaching points and in small groups in homes. Pray for the growth of the Orality Network; that missionaries and local believers alike would see the need for oral methods of evangelism and discipleship. Pray for the translation of the evangelism track Bible stories into Kuy and their widespread use among the Kuy villages.